To explain why I love Quentin Tarantino, who better to do so than the jabbery film geek himself? "I don't want people coming out of my movie with only one idea of what it's supposed to be about," he says, in essence, on the Reservoir Dogs DVD commentary. "I want a million different people to come out with a million different ideas, as if they've each seen a million different movies." This generously democratic ideal -- embedded in all of his films, including his latest, Inglourious Basterds -- helps me to forgive Tarantino's many flaws. Not there's any shortage of criticism: I've already heard Basterds described as "irresponsible" and its director "an embarrassment," among other things. I can respect and acknowledge the validity of some of the charges while still considering it so far the movie of the year. One swipe against Tarantino that is always off the beam -- and this where, I think, a certain myopia informs the basis of all attacks -- is the accusation that he makes testosterone-packed action movies as sop for his "fans." If anything, he's gone out of his way to alienate whatever fan-base may exist: Reservoir Dogs concluded with its colorful ensemble whacked, Pulp Fiction with its ultimate badass playing peacemaker instead of pumping lead; Kill Bill Vol. 2 followed the blood-splattery Vol. 1 with what Charles Taylor astutely called "a comedy of fidelity," one with barely any violence at all; Death Proof, originally the second-half of a three-hour Grindhouse epic, subverted the B-movie genre to which it was ostensibly paying tribute. 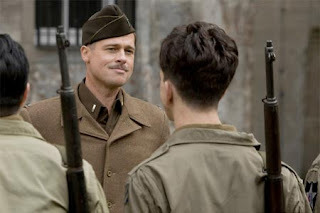 Inglourious Basterds has been hyped as a Dirty Dozen-ish WWII flick; yet with typical perversity, Tarantino has made a war movie wherein its warriors are along the periphery rather than at the center. 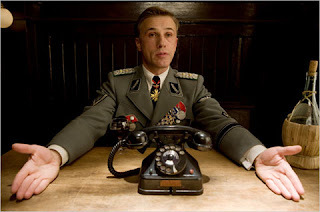 That center is occupied instead by Shosanna Dreyfus (Melanie Laurent), a young French-Jewish woman who escapes the clutches of a cunning Nazi "Jew-hunter" named Hans Landa (Christoph Waltz), changes her identity, and becomes the owner of a cinematheque in German-occupied Paris. This character brings to the fore a fistful of Tarantino's pet themes: the power and vulnerability of women; the issue of race via Shosanna's love interest, the African-immigrant projectionist Marcel (Jacky Ido); and, of course, the director's uncontainable enthusiasm for movies themselves. You see this love by how tenderly Shosanna cleans the letters of the titles on her marquee. (Robert Richardson's cinematography, light-years above the visual drabness of QT's earlier pictures, practically caresses the images.) Yet as she attracts the unwanted attentions of a wide-eyed German war hero (Daniel Bruhl) and, subsequently, that of the Third Reich's high command to co-opt her theater for a premiere, Tarantino is also reminding us of something too often forgotten: that movies -- that art -- can be dangerous. A filmmaker wishing to appease his audience would have put us through the familiar paces of the genre: training; colorful personalities; planning the attacks; violent catharsis. Tarantino largely dispenses with these tropes, jump-cutting from the introduction of the team to a scene after the Basterds have already earned notoriety. Although he does ultimately, as they say, deliver the goods (as with the Bear Jew's baseball bat), QT remains far more interested in the elaborate building of suspense than its release. The avuncular "Jew-hunter," Landa, is essentially a stand-in for the director, always three steps ahead of everyone else, casually toying with his victims before lowering the boom. But the scene that best explicates Tarantino's M.O. is a nerve-rattling set-piece in a tavern that features not Landa but rather a group of drunken Nazis, a trio of undercover Basterds, a vivacious German starlet (Diane Kruger), and a relentless German major who won't let a suspicious accent go. For nearly thirty minutes Tarantino adds one development on top of another, tightening the screws so far beyond the pale it would have made Hitchcock scream, "Enough!" The brutal tactics of the Basterds (who are encouraged by the part-Apache Raine to scalp their victims) and especially the apocalyptic climax in Shosanna's movie-house -- where a pair of disparate assassination plots finally dovetail in a manner that plays like a bizarre cross between The Dirty Dozen and Brian De Palma's Carrie -- have been derided by some. In a thoughtful critique, Daniel Mendelsohn accuses the filmmaker of playing a game of reversals -- of turning Jews into Nazis and Nazis into Jews and thereby cheapening the Holocaust via false equivalency. On the surface, I can see the author's point; and I would give it greater validity if tragedy didn't befall the heroes of the film as much as its villains. Moreover, the Nazis are not "tricked" into entering the cinematheque, as Mendelsohn claims; they bully Shosanna into hosting the premiere there, and she takes shrewd advantage of their manipulation. One could even go further and observe that the movie is held there in the first place because its star, Private Zoller -- the aforementioned Nazi hero who takes an unsuspecting shine to this closeted Jewish woman -- insists upon it in the hopes that it will impress the object of his affection. Tarantino has never been a political filmmaker; he's a deeply personal one whose love for character is as affectionate and observational as it is pitiless. There are more levels and layers to Inglourious Basterds (and Tarantino's entire career) than its daffier critics are giving it credit for. (Nation's Pride, the monotonously violent Nazi film-within-this-film, is like a parody of what Tarantino's non-admirers believe his movies to be.) Armond White incoherently compares Basterds unflatteringly to not only love-of-his-life Spielberg's Saving Private Ryan but Frank Capra's Why We Fight propaganda series, as if Tarantino's picture shared the same universe with them. Even a relatively complimentary new article at Slate that asks if "one of the most overrated directors of the '90s one of the most underrated" today is another of the contrarian online mag's breathtakingly meaningless provocations. (I eagerly await: "Is Your Toilet Trying to Kill You?") If nothing else, we have a teeming ensemble of characteristically memorable performances. Pitt crafts a hoot of a caricature in Lt. Raine. The heralded Waltz (who won Best Actor at Cannes earlier this summer) fashions a Nazi unlike any Nazi you have ever seen. Amusing in a bit part is a nearly unrecognizable Mike Myers as the British mastermind of one of the assassination plots (a piece of stunt-casting reminiscent of John Candy in JFK), as are effective voice-cameos from Harvey Keitel and Samuel L. Jackson. In the most prominent female roles, Laurent and Kruger convey varied sides of Tarantino's own complex view of the feminine mystique. Fortunately, Inglourious Basterds has much more going for it than a list of good actors. As Owen Gleiberman once described Pulp Fiction, it's a "feel-alive" movie, Tarantino's biggest mindblower since that revolutionary film (my head was spinning for hours after seeing it), and makes most movies today look gutless by comparison. If I'm troubled by certain elements, I'm less offended than I was by Saving Private Ryan, which Tom Carson notes pretends to be an authentic depiction of the historical record while actually glorifying cliches. Inglourious Basterds offers no such pretense. The deliberately misspelled title (in addition to being an in-joke about its creator's infamous illiteracy and a failsafe against nervous advertisers) tells us immediately that this is a film that establishes its own rules. Like Stanley Kubrick, the Coen brothers, and few others, Quentin Tarantino has proven himself to be a director whose movies hold up well over the years; like those other filmmakers, all creators of their own worlds, his movies exist outside of history and time. They're also more accessible than the product of most auteurs -- at least for someone like me, who was grinning all throughout his latest and who wants to see it again. There are possibly a million different movies here, each one worthy of analysis, and a few even deserving rebuke. For me, though, one rises above the others. Inglourious Basterds is a brilliant piece of crazy. Your wonderful - and glowing - review here really builds up my anticipation for the film. I'm aching for a masterful piece of filmmaking, and I'm really hoping for a satisfying viewing experience. I'm on vacation with my family in California right now, but I hope to see this movie at the Arclight in Hollywood at the end of our trip. I'll be curious to see what you think, Hokahey. Let me emphasize again, it's a movie I'm struggling with. As Roger Ebert said after he first saw Pulp Fiction: "It's either the best film of the year or the worst. I hardly knew what the hell had happened to me." But QT's movies always look better on repeat viewings, once the dust settles; and I've a hunch this one will too. "So far the movie of the year." Ah-men. I've heard people complain about the misleading trailers, which promise an action bonanza and delivere a subtitle-laden art film. Perhaps, but it's brilliantly misleading. I wonder if audiences who came to cheer at a gorefest about Americans slaughtering Nazis will recognize that movie in the film-within-the film gorefest about Nazis slaughtering Americans (which plays to cheering audiences). Of course, that kind of ambivalence goes against Armond's insistence on "moral clarity" as exemplified in... G.I. Joe: The Rise of Cobra. Excellent review. I especially liked your discussion of the set-piece scene in the tavern. I found the layout of the bar intriguing because it gave the German Major the opportunity to listen in to the various conversation from a hidden nook that the viewer doesn't know about until late in the scene, and I especially enjoyed the wit and flair in which he kept after Hicox. He proves himself able to quickly figure out the popular culture reference to King Kong--the one true proof of intellect by postmodern standards. Offhand, I don't know of any recent film that has the style and swagger of Basterds, even given its limitations. Craig: If the best films are often ones that cause the audience to struggle to comprehend them, the best reviews are often ones in which the critic's uncertainty comes through. That's my way of saying, great review. You make many arguments confidently, but I can feel you wrestling with the bigger picture. It creates a vulnerability, if you will, that I think makes writing feel alive. I'm going to save my thoughts for my upcoming convo with Ed. I'm planning to see the film a second time tonight in the hopes of gaining a better understanding myself. I'll be returning to this review, too. I hadn't thought about this, but it's a terrific observation. Watching that first scene, when Landa asks the farmer that they switch to English, I remember thinking it a lazy nod to American audiences, as if to say, a la Hunt for Red October, "Okay, we've established we're foreign; you don't have to read subtitles anymore." But Landa's motive turns out to be ingenious. I wasn't sure why Shosanna chose to do her home-movie in English, but most of the film leading up to then is, I would estimate, in languages other than English. Tarantino obviously got a big kick out of writing dialogue for characters from a variety of linguistic and cultural backgrounds. Brad Pitt's Eye-talian accent was also absurdly funny. I liked the production design for that too. Also for the big room where Hicox meets Churchill and Austin Powers. We discussed this over at your site, but I enjoyed that scene more than most. In style and tone, it looks like a scene out of a David Lean epic, only with Mike Myers there in the corner. A Mad Magazine-type gag, another nifty piece of war-movie deconstruction. I'm going to save my thoughts for my upcoming convo with Ed. Uh... yeah... well, you're wrong. (I'm just joshin' ya!). OK, so lots of stuff here, but you're one of the first to bring up Shoshanna's projectionsist - and I'm glad you did - so let's go there. You say that IB brings up, "the issue of race via Shosanna's love interest, the African-immigrant projectionist Marcel (Jacky Ido);". This character was a curious one to me. Since Marcel was so underused, my first thought was that it felt like a concession in response to racial criticisms from people like Spike Lee. And, to be honest, that was also kind of my reaction to the poorly written Traci Thoms character in Death Proof and the Vivica Fox character in Kill Bill. Now, I don't think Tarantino has racial issues at all, and I think Lee's criticisms are bunk, but I will admit feeling that Tarantino felt a little unsure of how to handle Marcel and his relationship to Shoshanna. He almost even seemed to do a better job of hinting at a chemistry between Shoshanna and Zoller than at anything between Shoshanna and Marcel. Fox, I'm glad you brought this up too. I would have liked more between Shosanna and Marcel; it's a weak point, ableit not a major one for me. I don't think it was a question of QT's reluctance or uncertainty (since when is that an issue?) but rather him using some emotional shorthand to convey their relationship to counter the more operatic elements (in ample supply) of the film. Now, you can argue as to *why* he chooses to underplay that relationship: maybe he was trying to avoid the standard "love-triangle" silliness (since, in Shosanna's mind, there isn't one). It's a potentially interesting relationship and that part's unfortunate. Whatever the reason, I was still moved by their goodbye scene. And I did feel kind of bad for Zoller despite myself, who isn't a hero but also not completely without merit. What do you think that look on his face was when he was watching "Nation's Pride" -- embarrassment? Something else? And, to be honest, that was also kind of my reaction to the poorly written Traci Thoms character in Death Proof and the Vivica Fox character in Kill Bill. -- I honestly don't remember Traci Thoms's performance enough to say yay or nay. But Sydney Poitier made a big impression in that same movie, and Rosario Dawson has never been more vivid onscreen. Tarantino adds one development on top of another, tightening the screws so far beyond the pale it would have made Hitchcock scream, "Enough!" This is another thing that surprised me in my catch-up reading. I fully expected outrage and debate about Nazis being made victims (deserving or not) in the final scene. But to rip a film's historical inaccuracy when it's so obviously a fantasy (hello, Hugo Stiglitz intro!) while so many supposedly accurate films are loose with the facts, well, to me that just shows how our opinions can be guided by our politics: we don't like Nazis, so they must be evil; we do like Americans, so they must be heroes. Etc. Strange. Pitt crafts a hoot of a caricature in Lt. Raine. I'm also stunned how many people dislike Pitt's performance for being a caricature, as if it isn't obvious that that's the point. I suspect at the root of this is the feeling that since Pitt is the biggest star on screen that she should deliver the biggest and most memorable performance, and that since he doesn't it's a "fault" (his or QT's). Sorry, folks: Hyping Waltz wouldn't have packed the multiplexes. Though the end result suggests that would be the way the film should have been sold, if marketing was in any way based on the realities of the product. OK. That's all for now. Just wanted to say that I enjoyed reading this again. Good stuff. This is a superlative review that contains some remarkably fierce insight. I don't comment that frequently at other peoples' sites any more -aside from a handful of individuals that I know fairly well. For the last two years, I've been good friends with another film blogger named Craig (as in Kennedy, of LIVING IN CINEMA). He's a smart, sharp guy who digs film and knows a lot about it. Considering that that particular moniker can not be picked effortlessly out of the sky, who knew there would be two of you...? Not I. It's definitely unexpected. You have impeccable taste. I know this for a fact because your predilections perfectly mirror my own. I participated in a James Bond blogathon last year which coincided with the release of Quantum Of Solace. It was effectively JB week over at my site. I reviewed QOS,(both versions of) CASINO ROYALE and some old favorites from years gone by. CS seven times in the cinema (when I ardently adore something, I have a tendency to get obsessed) your series was extremely illuminating. Also greatly enjoyed your selection of favourite female actors. Those are some powerfully formidable chicks. They're all fantastic. LAUREN BACALL (at #10) and JULIE CHRISTIE (at #13) made my list as well. Plus anyone who loves THE GRADUATE and TOOTSIE (as well as knowing who ANNE COATES is...and recognizing and admiring her expertise) deserves a medal of honour. certainly AM worth it...), but that really won't fly in this particular instance. Jason - The only time I grew restless was the scene where Landa has his sit-down with Raine and Utivich. The scene is fine in and of itself, but it's the least enjoyable of all of Landa's leisurely interrogations (especially since we know his game by now) and it interrupts the momentum toward the climax. I suspect that's why QT put it there, but it's the only scene that I wish were trimmed down. Miranda - Um, wow. Dunno what my "mama" would say about my taste, but thank you for the kind words. I put a lot of work into that Bond series, and it was a lot of fun to do. "If I'm troubled by certain elements, I'm less offended than I was by Saving Private Ryan, which Tom Carson notes pretends to be an authentic depiction of the historical record while actually glorifying cliches." Yes! I agree! And I included some criticisms of that film in my review of Basterds. "Inglourious Basterds is a brilliant piece of crazy." Well said! Not only does this movie make most others appear "gutless," as you say - it makes them seem poorly made in comparison. Hokahey - That was a good call in your IB review that mentioned SPR. I'd forgotten that ridiculous scene. Thanks, Craig. Tarantino has made an interesting shift from the reverent (and not really entirely realistic) WWII films of Spielberg and Eastwood to a wild, very different take on WWII. I'd like to see Tarantino's film inspire more films that are original takes on the genre. Thanks, though after seeing it the 2nd time, it seemed even more brilliant but far less crazy. Considering where it goes, the movie makes an astonishing amount of sense. A great review. I haven't come across your blog before. I especially enjoyed your discussion of Tarantino as being the opposite of a lazy crowd pleaser.